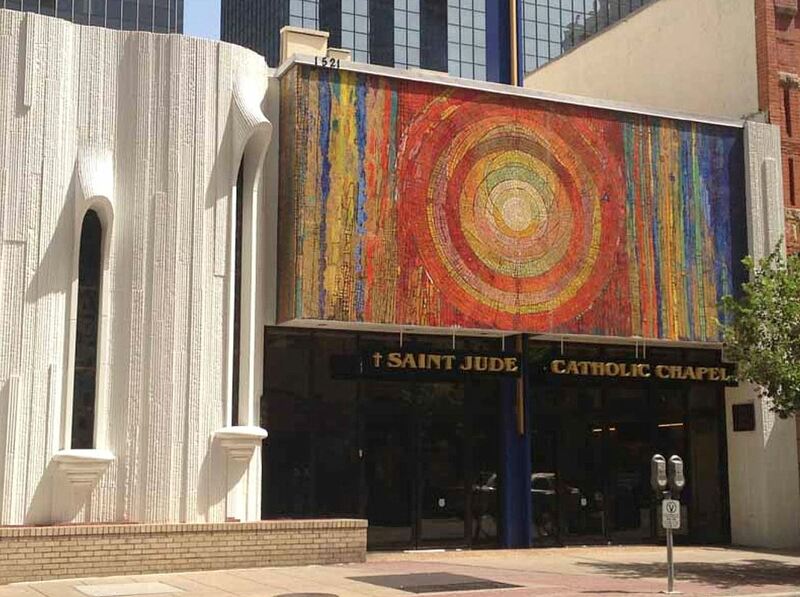 Perhaps you’ve noticed the intensely colorful sunburst-like mosaic that adorns the Saint Jude Catholic Chapel at 1521 Main Street, near Stone Place. It’s hard to miss. The artist is Gyorgy Kepes (1906-2001), an important Hungarian-born avant-garde painter, photographer, and educator who immigrated to the United States in 1937. He taught for a short time at North Texas State University (now the University of North Texas) in the mid 1940s, and may be known best in Dallas for his work as artistic director for Temple Emanu-El in the late 1950s, a project which artfully brought together contemporary art, architecture, and design into a sacred space. 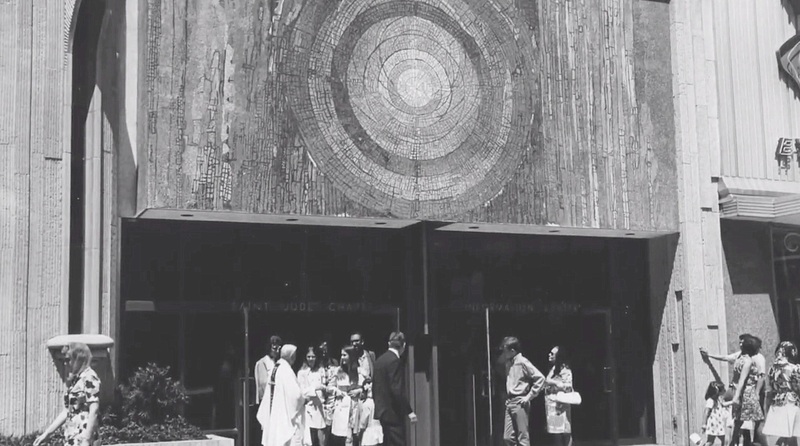 At the time Kepes was commissioned to create the mosaic for the new Saint Jude Chapel (which opened in 1968), he was immersed in founding the Center for Advanced Visual Studies at the Massachusetts Institute of Technology (MIT). One wonders how he found the time! This mosaic — which as far as I know is untitled — is probably a familiar sight to people who work and live downtown, but most who pass it are completely unaware of the name of the artist. I hope I’ve helped correct that a bit. 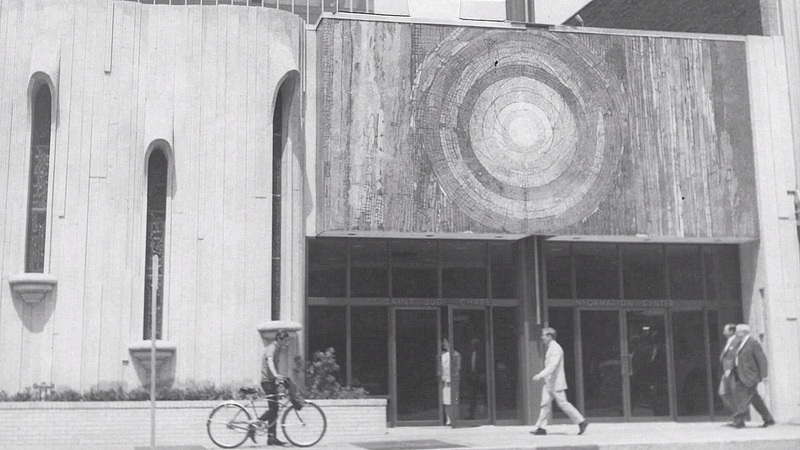 Thank you, Gyorgy Kepes — and thank you, Saint Jude Chapel — for this nice little addition to Dallas’ public art. All photos from the Saint Jude Catholic Chapel website, here. The undated black-and-white photos are from a video history of the chapel, here. Read about Gyorgy Kepes in overviews of his life and career from MIT, from the James Hyman Gallery, and from Wikipedia. I have been unable to find any information about this mosaic. Had I not stumbled across Kepes’ name in a Sept. 14, 1968 Dallas Morning News article about the new chapel (which I was reading while researching the very interesting history of the building the St. Jude Chapel is in — and the building next to it) (that post is here), I’m not sure I’d be able to track down the identity of the artist. It’s surprising how little is out there about such a prominently displayed work of art! Been to many a lunchtime mass at that wonderful little chapel. The inside has a nice vintage/ mid-century feel to it, along with another giant tile mosaic of Jesus (perhaps same artist?). This place is a hidden gem downtown. It looks like the top view of a tree that’s been cut. Didn’t know it can look very artistic when applied with colors.